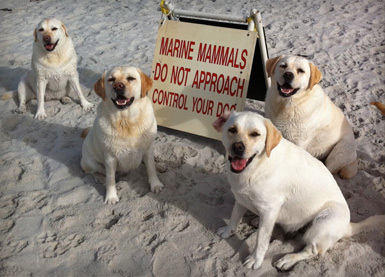 Monterey Bay Labrador Retriever Rescue is a small, close knit group of lab rescue “pros” who love labs and have many as part of our own families. We’ve all been affiliated with other lab rescue organizations for as long as 25 years and feel that our smaller, more personal approach to adopting a lab will make your search for a new family member a pleasant and rewarding one. We all live on the Monterey Peninsula and love what we do. Even our amazing logo comes from the Monterey Peninsula. It was designed by renowned artist, Will Bullas, who lives right here in Carmel Valley and who generously donated his time and talent to create something special for the labs. Our fosters are all local and are very experienced. Most all have labs of their own and their labs help the rescues feel at home while they’re in transition to their new homes. The fosters provide the food and the love for each rescue lab, and spend countless hours with them, helping them learn the basics… like housebreaking and a few basic commands. Many of our fosters have fostered 50 dogs or more for us over the years. Our transporters use their own vehicles to pick up labs from shelters in many different places and spend hours on the road bringing them to us. And our amazing vets, Dr. Tom and Dr. Shannon from Carmel Holistic Veterinary Clinic in Carmel, give us a great discount and provide excellent care for each dog. We carefully evaluate each dog for behavior issues and do not accept any dog into our program that shows aggression towards people or other dogs. We place each dog in an experienced, loving foster home so we can see how the dog does in a home setting. We provide you with information as to the dog’s house manners, any commands the dog knows, how they behave on a leash, how they interact with other dogs, how they travel in a car, their activity level and exercise needs, and what each dog will need to best succeed in his or her new home. 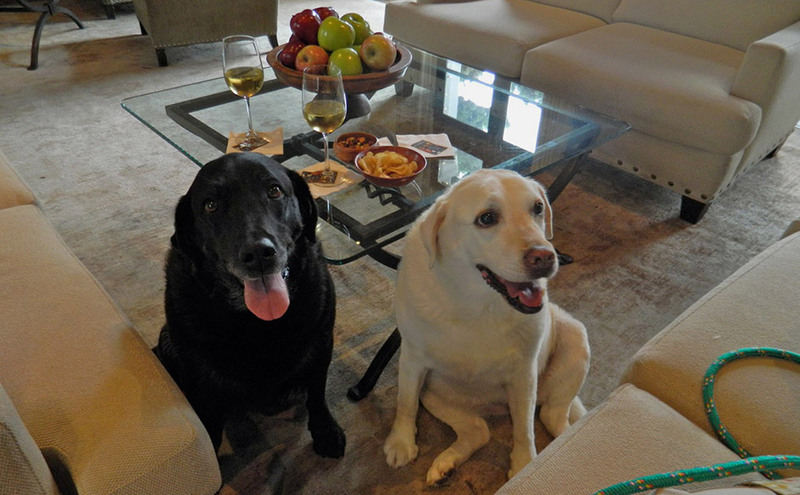 After you adopt a lab from us, we keep in touch with you to make sure the transition to your home is a successful one. If you need advice, we’ll happily give it, and you can call us with any questions you might have at any time. If you need help with training, we’ll do what we can to point you to good people who can help and if, for any reason, you feel that dog you adopt is not a good fit for your family, we will take him or her back. We are absolutely committed to finding the best homes for each and every one of our dogs. It’s important to know that almost 100% of the monies we raise at Monterey Bay Labrador Retriever Rescue goes to the dogs and their care. We work out of our homes, we use our own cars, and we donate all of our time. Most of our expenses are for vet care and we’re very careful to spend all of our donations wisely and efficiently so we can help as many labs as possible find new homes.